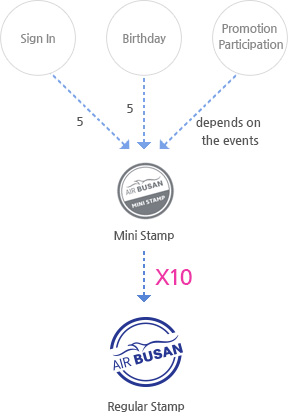 Extra mini stamp provided when participated in various promotions. If you save more than 10 MINI STAMPs, you can convert them to regular STAMPs on the page [My STAMP > View All]. The expiration date of MINI STAMP is 6 months from its saved date, and the expiration date of the converted regular stamp is 1 year from the converted date. MINI STAMP is not transferable. The converted regular STAMP shall not be re-converted to the MINI STAMPs.